Who can ever get enough of Workaholics? Every Wednesday night on Comedy Central, Adam Devine, Anders Holm and Blake Anderson make our stressful day at work seem like heaven on Earth compared to their hilariously dysfunctional and batshit crazy experiences at their telemarketing firm. It's a cathartic experience we just want to relive over and over again once every new episode ends. And thanks to GIFs, we certainly can whenever we want. So, if, like us, you can't wait to tune into the new episode tonight, get your fix with the 50 funniest GIFs of Workaholics (so far). 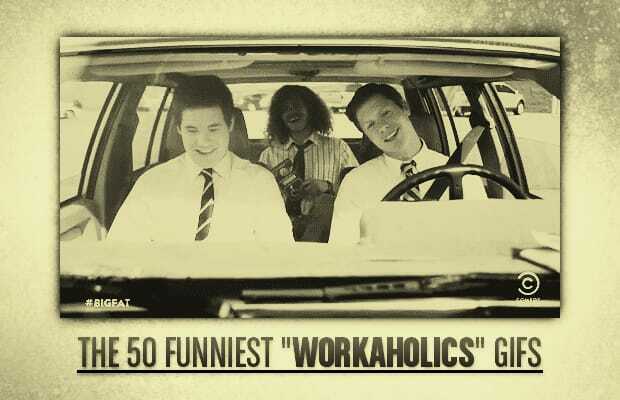 RELATED: Adam, Anders & Blake Cover Complex's "Workaholics" Week!